ASK EACH CLIENT IF THEY ARE ALLERGIC TO BAND-AIDS OR ADHESIVES BEFORE YOU APPLY THIS PRODUCT. This product does not contain latex, but some people are allergic to adhesives. Do not use this product on any person who is allergic to band-aids. If you spill this product on clothing, rinse it out with 91% isopropyl alcohol before it dries. Soap and water will not remove Pros-Aide Liquid from clothing. A neck, chest, face, back, belly, arms and shaved legs are ideal places to apply Pros-Aide Liquid Adhesive. If you apply this product to hairy skin, removal will be as difficult as getting bubble gum out of a cocker spaniel's ear. You can remove dry adhesive from skin by rubbing it with the sticky side of scotch tape. 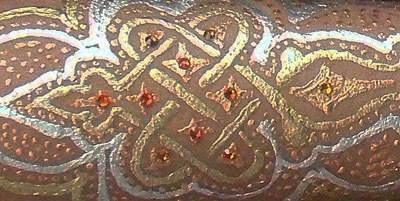 This brushwork technique is nothing lke applying henna with a cone. If you haven't done this before, follow these instructions and practice on yourself before you try to work on someone else. This will help keep the adhesive secure so it doesn't tip over. If this adhesive spills, it makes a sticky mess that is difficult clean up. Do everything you can to keep yourself and your work area tidy. Keep the bottle of Pros-Aide Liquid closed so the adhesive will not dry out, and to avert accidents. Use a straw as a pipette to pick up a few drops of Pros-Aide Liquid from the bottle; drip the liquid into the cap. Use only a few drops at a time, so it won't dry out before you can paint with it. 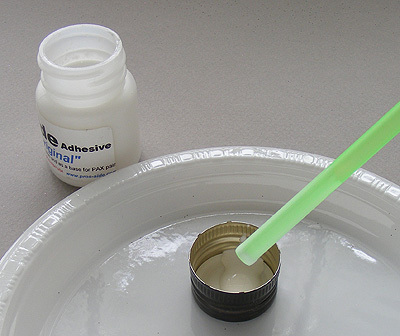 Dry glue cannot be thinned out and reused. Before you apply this body art, clean the person's skin. Remove lotion, sunblock, and anything else that might spoil the pattern. Dampen the skin slightly with a moist cloth or spray bottle. 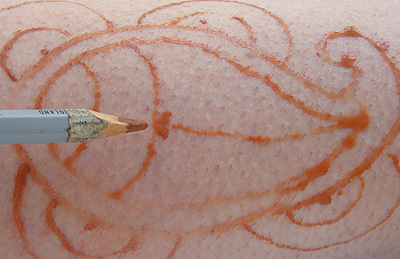 Sketch your pattern lightly onto damp skin with an aquarellable pencil. ;Pros-Aide liquid dries transparent very quickly, so it is difficult to keep track of what you're drawing, and some guidelines will help. 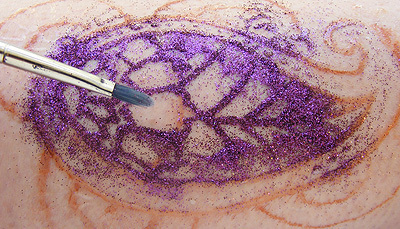 Use a small brush to apply the pattern. As the glue dries on the brush, wipe away the dry bit with an alcohol pad. The glue will begin to dry quickly. If your lines are thin, the glue will be dry in five minutes. When the body glue becomes completely transparent, and you can't see any more white, it is dry enough to apply glitter. 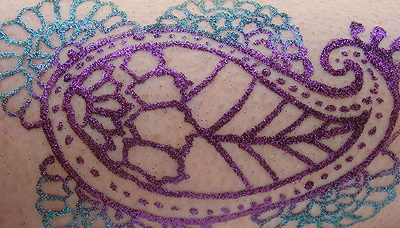 When the glue is completely dry and transparent, brush glitter on, and brush away excess. 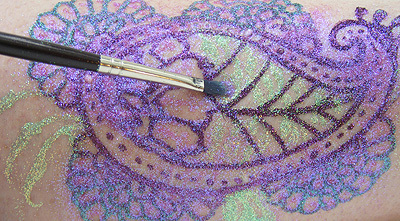 Brush very lightly to spread the glitter exactly where you want it to go. Do you want a design with many colors? You can brush in more colors, but the colors may blend together. Brush away the excess with a wide brush or a blusher brush, or a soft dry, washcloth. Rinse off excess glitter, metallic powder, or gilding powder and the aquarellable pencil outline with your water spray bottle and a paper towel. Water will not disturb the pattern. Do you want to add more, clearly separate colors? Apply more glue and let that dry. When your second glue application is dry, brush in another glitter color. Brush away the excess with a blusher brush or a wide, flat brush. No more worries about aftercare! The person can put clothing on over this body art. The person can shower, and the art will not come off! 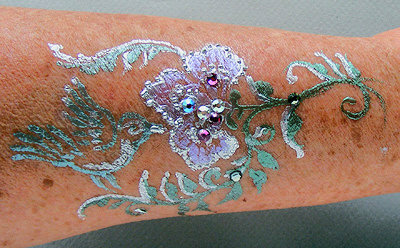 This body art will last between three and ten days, depending on how the person takes care of their art. Clean your brushes with 91% isopropyl alcohol any time the Pros-Aide Adhesive seems to be dragging at the brush, and when you set your brush down for a few minutes. When you are done, clean your ;brushes thorougly with isopropyl alcohol. 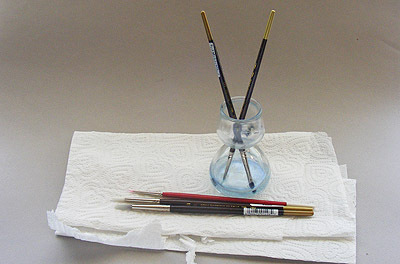 Dried glue can not be removed from brushes. 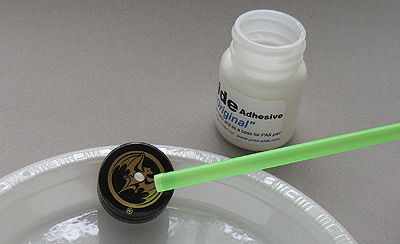 Brush gilding powder with Pros-Aide Adhesive "The Original" Liquid for shimmering effects. 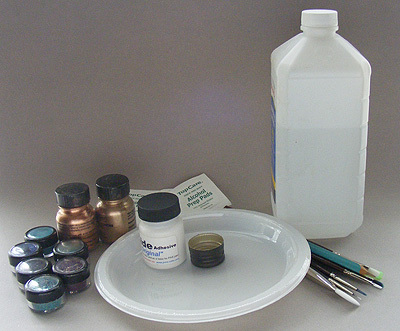 Click HERE to purchase gilding powder. The darker the skin, the more dramatic the effect. You can use Mehron Metallics with Pros-Aide Adhesive "The Original" Liquid. Click HERE to purchase Mehron Metallics. You can add gems with Pros-Aide Adhesive. Click HERE to purchase gems.